Well, well, another crack in the Democrat party’s cacophonous coalition of special interest groups. It seems that the scholastic sinkhole that masquerades as the Los Angeles school system has finally sunk low enough for local community groups to stand up to the treacherous teachers’ union. On Monday, several minority groups, in conjunction with the United Way, placed a full-page ad in the LA Times publicly declaring an in-your-face confrontation with the teachers’ union. A crack-crack here, and a crack-crack there, here a crack, there a crack, everywhere a crack-crack. 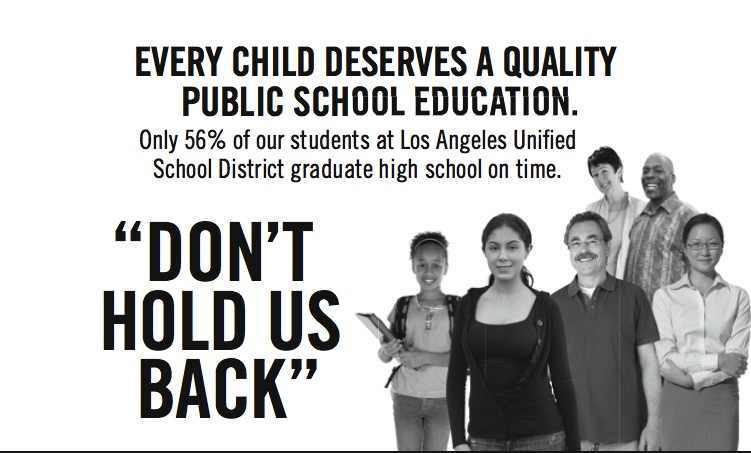 This entry was posted in Education/Campus, Political/Social and tagged Don't Hold Us Back, LA school district, LAUSD, minorities, teachers' union. Bookmark the permalink. The groups sponsoring that full-page ad are all backed with money by the Bill and Melinda Gates Foundation. In essence, they’ve traded their souls for cash. I’m no fan of Gate’s foundation–their money has funded Bill Ayer’s Marxist schemes and other dangerous nonsense. But if they want to throw their money into groups gunning for the LA teachers’ union, I say, let it be. Let these Lefty groups go after each other.